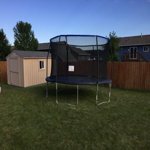 After three days of having the trampoline assembled, my children are super excited to use it. I would like to add, that the trampoline came in two boxes and was well packaged. It took just under three hours to assemble it myself. Overall it's well constructed and easy to assemble just follow the instructions. 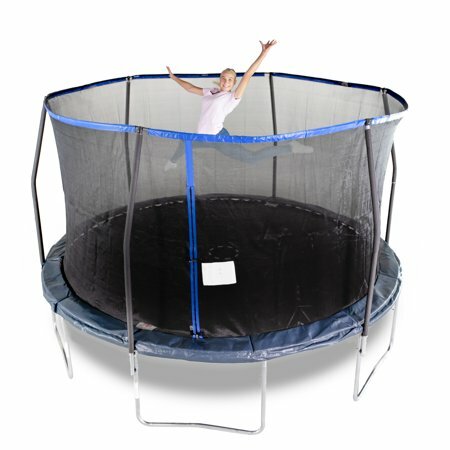 I price shopped all trampolines and this was the best deal I found for the size I wanted and brand. BouncePro get great ratings so I trusted the brand happy to find that it lives up to expectations. Not only it's a great deal but I also got it on shipping pass so it came in 2 days. And bonus, it was easier to assemble than I thought! Nice trampoline for the money. Material feels sturdy and instructions are fairly clear. Took about 3 hours to assemble with 2 adults but all pieces were there and fit together nicely. Hardest part was the stringing the safety net but it is definitely secure. Assembling this was WAY easier with two people! Got it together in about two hours. So many pieces, so much assembly...lucky to have received all parts to assemble, as many reviews mentioned not having or receiving all of the pieces. Purchased this in store ($198+tax) but wasn't offered the additional, optional warranty. Walmart.com pricing was $229 (supposedly marked down from $329) for the exact same item. Pad that ties down over the springs did not match the pic on the box, but still perfectly fine. With warning of time consuming assembly, I would recommend this purchase.